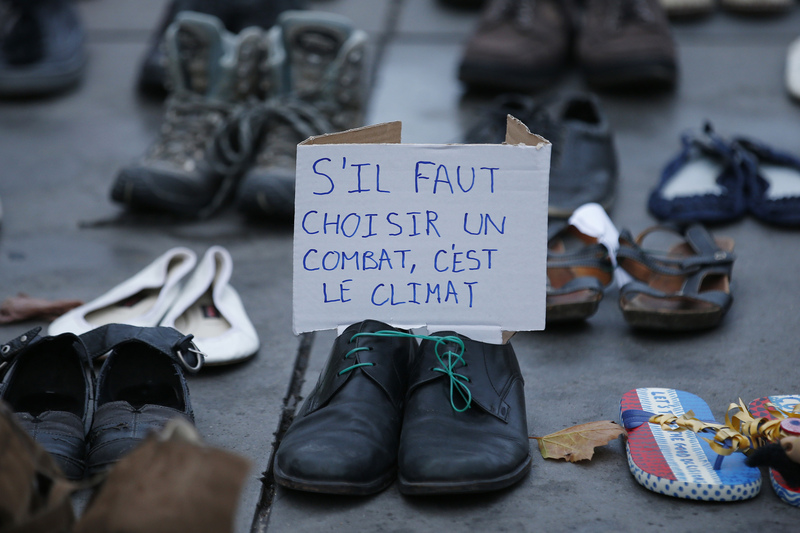 Photographs of calls for climate action from the People’s Climate March around the world. On the eve of the opening of the UN climate change conference in Paris, campaigners around the world from Melbourne to London are marching to demand action. A day of celebration and hope in Paris disintegrated into rioting and clashes with police on Sunday, after anti-capitalists and anarchists hijacked a peaceful event organised by climate activists earlier in the day. About 200 protesters, some wearing masks, fought with police on a street leading to la place de la République, which has become a gathering place for Parisians since the terror attacks on 13 November that killed 130 people. Witnesses said floral and other tributes were trampled in the melee. NEW ZEALAND – Showery spring weather did not dampen the spirits of thousands of New Zealanders who took to the streets this weekend to demand stronger government action on climate change… An estimated 15,000 people marched in Auckland, 8000 in Wellington, and 3000 in Christchurch – the smallest being on Raoul Island, where the island’s entire population of seven turned out. This weekend, tens of thousands (perhaps hundreds of thousands) of people in cities around the world will take to the streets to protest against governments’ inaction on climate change. Past experience suggests media coverage will be largely sympathetic, if cursory, and (many) politicians will say that they hope the Paris climate summit that begins immediately afterwards represents a turning point. We have been here before. Quite often. There have been demonstrations at international climate meetings since at least 1990. However, “sympathy” marches in places far removed from the climate talks – such as those planned this weekend – are less frequent. So, can they make a difference? Find out how and why the Earth’s climate is changing as Paris prepares to host a summit to discuss global warming. In short, the world’s governments have already committed to curbing human activities such as burning fossil fuels that release the gases that interfere with the climate. But that isn’t problem solved. The difficulty comes when you try to get 195 countries to agree on how to deal with the issue of climate change. On Monday the Paris climate summit kicks off, with delegates arriving from every corner of the planet hoping to stitch together a new global deal to tackle greenhouse gas emissions. The United Nations climate negotiations are complicated, frustrating and opaque even at the best of times. What follows is by no means a complete guide, but here’s a few things to keep in mind as the talks get under way. The Paris climate change talks – the 21st annual Conference of the Parties – begins this Monday, and there is a lot at stake. For the environmentalists, and anyone who can understand basic science, it is about protecting the world against the ravages of runaway climate change. The most in industry, it is about sending the policy and market signal that this is finally being taken seriously. For the fossil fuel industry, it is about protecting their future. Here are some simple graphs that illustrate the challenge ahead. As the 40,000-plus attendees to the Paris climate summit congregate on Monday at a former aircraft hangar in north-east Paris, a surprisingly large chunk of Australian big business will be cheering them on… It is certainly not a Damascus conversion: the statements many chief executives have put their names to are meticulously worded and come with plenty of caveats from companies on the side on the realities of the energy mix, and of continuing reliance on fossil fuels. Microsoft co-founder Bill Gates will launch a multi-billion-dollar clean energy research and development initiative on Monday, the opening day of the United Nations climate change summit in Paris, it was reported on Friday. AUSTRALIA – Connecting new housing estates to their own private electricity grids fuelled by renewable energy is the cornerstone of ZEN Energy’s plan to put power back in the hands of consumers. The company has launched ZEN Communities – an “end to end” service from power generation through to networks and retailing to deliver low cost renewable energy direct to entire communities. AUSTRALIA – Melbourne businesses, local councils and universities will pool resources to build new renewable energy plants under an innovative push to boost the supply of clean power to the city. To be launched on Monday, just as the Paris climate summit gets under way, the project is a first for Australia. At least a dozen backers will pool their electricity purchasing power with the aim of encouraging new wind or solar energy. It is being led by the City of Melbourne, which carried out a year-long test of the market to see whether there was enough interest for it to be viable. Canadian researchers say they have developed a power cell that generates electrical energy using the photosynthesis of blue-green algae, generating renewable energy while removing carbon from the atmosphere. Dr Andy Reisinger [is] deputy director of the Palmerston North-based New Zealand Agricultural Greenhouse Gas Research Centre, which is searching for ways to reduce the amount of methane belched from sheep and cattle – our biggest source of greenhouse gas emissions… Currently, almost half (48.4 per cent) of New Zealand’s gross greenhouse gas emissions come from agriculture Back in 1990, slightly more than half (51.5 per cent) came from agriculture The share of agriculture in total emissions dropped because other emission sources (mainly power generation and transport) rose faster over this period (by 29 per cent) than emissions from agriculture (by 14 per cent). Deliberately, knowingly, destroying the stable climate on which our civilisation depends, is insane. In the early 1990s I needed a job and found myself working for a year and a half on the assembly line at Mitsubishi in Adelaide. I put on the right front door lock for a few months, then moved to the left front headlight. Smoked a packet a day at my workstation…. Back then none of us knew anything much about climate change. We were happy to have a pay check each fortnight, even if the work itself was dull and injuries were common… The science is unequivocal, as the International Energy Agency says: if we want to avoid dangerous climate change we cannot afford to burn even half of the fossil fuels already discovered. Not even half. If we can’t burn what’s already discovered, why the hell are we searching for more oil? On the eve of the Paris climate conference, a new analysis from Stanford University has laid out a roadmap for 139 countries to power their economies with solar, wind, and hydro energy by 2050… The Stanford study focuses on what is has dubbed “WWS” – wind, water and sunlight. And it includes not just electricity but transportation, heating and cooling, industry, and agriculture, forestry and fishing. Humans have long been fascinated with big cats, the eight largest of Earth’s 37 wild cat species. “Of all the great creatures, they are perhaps the most magnificent, iconic, and fabled,” says conservation scientist Luke Dollar, a National Geographic Emerging Explorer. Their size and power makes big cats top predators, helping maintain the balance of the ecosystem by controlling prey populations, says Dollar. NEW ZEALAND – The first Hector’s dolphin calf of the season has been spotted by tourists in Akaroa Harbour. Four adult dolphins and one calf were seen swimming in the upper harbour near Wainui on Sunday morning. Black Cat Cruises skipper Julian Yates said he saw four adult Hector’s dolphins at Wainui, and as they moved around he realised a baby calf was with them… Hector’s dolphins are among the most endangered species in the world. Their coastal habitat and slow reproductive rate mean they are particularly vulnerable to entanglement in fishing gear, especially gill nets. NEW ZEALAND – Eleven ecologically significant marine sites in the Marlborough Sounds cannot take anymore anchoring, trawling and dredging, a panel of marine experts have warned. Without protection or strong management, Marlborough’s significant marine sites will continue to be lost or degraded, some of New Zealand’s foremost marine scientists have told the Marlborough District Council. Council will have to decide if they should ban any activities that cause contact with the seabed on these sites. New Delhi: Eighteen village councils in northern India are demanding a local Coca-Cola bottling plant be banned from extracting water from the ground, claiming its over-use has led to water scarcity in the area. More and more studies are attempting to “value” nature by attributing (sometimes huge) dollar figures to things like threatened species. Apparently, this makes it possible to compare their value – for the record, a sea otter is worth twice as much as a sea turtle, according to one estimate. This fits within a wider approach that attempts to view and manage nature as an “asset”. Advocates argue that valuing the “ecosystem services” provided by “natural capital” and specific “natural assets” will ensure the environment is given due consideration in decision-making. Australian shoppers are predicted to spend nearly A$47 billion this Christmas. But retailers have to work harder and harder to get shoppers to pull out their wallets. Here are five strategies retailers will be using to get us to part with our hard earned coin. Recent research has shown that almost one third of the food produced globally is wasted. In the U.S., the figure reaches as high as 40%. There’s long been an intuitive assumption that there’s nothing wrong with most of the food wasted and a startup based in Washington D.C. called Hungry Harvest are now proving that intuition to be correct. The food writer Michael Pollan summed up how to eat healthily: “Eat food. Not too much. Mostly plants.” It is unlikely that when the British and American governments issue new dietary guidelines the advice will be quite so succinct, or sensible. National dietary guidelines are being reviewed on both sides of the Atlantic in the light of new evidence on food and health. The timing of the announcements presents a unique opportunity to also consider the impact of diet on climate change, coinciding, as they do, with the climate change summit in Paris. AUSTRLAIA – Opposition leader Bill Shorten has proposed an emissions reduction target of 45% below 2005 levels by 2030, based on recommendations from the government’s climate change policy advisory body, the Climate Change Authority. Shorten has also pledged zero net emissions by 2050, and ongoing reviews of the target. In its review, the Climate Change Authority recommended that Australia adopt a target of between 40% and 60% by 2030 on 2000 levels. Converting this to the 2005 baseline gives a target of around -44% to -63% on 2005 levels. So Labor’s target would match the very weakest within the Climate Change Authority’s range. AUSTRALIA – Eco-friendly, sustainable and DIY are not terms you would usually associate with the funeral business, but there are a growing number of families taking more active roles in funeral preparations. Holistic Funeral Director Libby Moloney is the founder of the Natural Death Advocacy Network, an organisation advocating holistic approaches to dying and death. Jacquelyn Hayward Gulati, a Toronto-based cyclist commuter, is considering whether to cycle through the coming winter. It is “only” -5C, she says, but temperatures can plummet to -25C and snow ploughs clear the roads for months. This winter, however, she is running out of excuses. For the first time, 49km of Toronto’s busiest bike lanes will be classified as “winter priority”, to be ploughed and salted. This is in part due to data collected by the Toronto Cycling App, a tool launched in May 2014, developed by tech company Brisk Synergies for the city, to inform development of the cycling network. People will keep studying one another and drawing on their ingenuity to build sustainable farms and food systems. Alan Scott jump-started a new old-fashioned approach to bread with his oven plans, offering an alternative route to a food that had been industrialized. Other innovators are fiddling with ovens and mills, turning dairy tanks and silo bottoms into malt systems, scaling down equipment and deindustrializing processing. They are making tools to fit a future they are shaping.